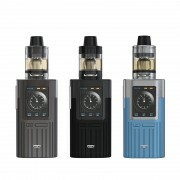 Joyetech ESPION Tour Kit includes ESPION Tour and CUBIS Max Tank. The CUBIS Max adopts innovative Joyetech NCFilm™ heater and coil-less design. The NCFilm™ heater is made of Kanthal and takes a horizontal building way to provide a larger heating area for huge clouds and optimal flavor. The atomizer comes with top-fill and top-airflow system, avoiding any leaks. 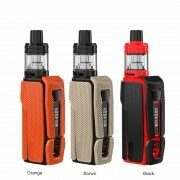 Powered by dual replaceable 18650 batteries, the ESPION Tour can reach a formidable 220W output. 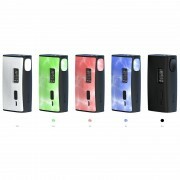 The box mod features 2A quick charging system. It has an intuitive 0.96inch display to present you with everything you need. Best at 40W, the ESPION Tour Kit will bring you huge but flavored clouds. ➤ 1. Innovative Joyetech NCFilm™ heater with coil-less design can deliver huge vapors and optimal flavor. ➤ 2. NCFilm™ heater can be cleaned with cloth for long life span. ➤ 3. CUBIS Max atomizer adopts the convenient push-to-open top filling design and innovative top airflow system, avoiding any leaks. ➤ 4. Powerful yet super light, the ESPION Tour can fire up to 220W with dual 18650s. ➤ 5. ESPION Tour is equipped with a 0.96inch intuitive OLED screen to present you with everything you need. ➤ 6. With the 2A quick charging system, the ESPION Tour can be fully charged more quickly than the normal ones. ➤ 7. ESPION Tour provides multiple protections for safety vaping. ➤ 8. The ESPION Tour comes with the upgradeable firmware. A. How to replace 18650s? B. How to charge ESPION Tour? C. How to fill Cubis Max Atomizer with e-liquid? ❤ Please read the user manual carefully before using this Joyetech ESPION Tour Kit with CUBIS Max. 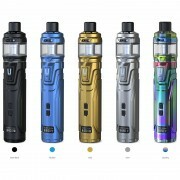 ☞ 6 months warranty period for Joyetech ESPION Tour with CUBIS Max Kit.